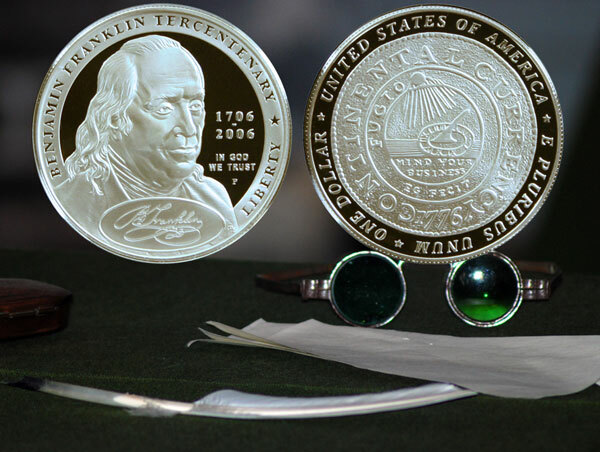 Today, the Benjamin Franklin Founding Father Commemorative Silver Dollar coin talks about the events in the Continental Congress 238 years ago. On that day, the obverse, Mr. Franklin, played a prominent role as did the reverse, the Continental dollar, in the treasury decisions. Agreeable to the order of the day, Congress proceeded to the appointment of commissioners to the court of France. Resolved, That three be appointed. The ballots being taken, Mr. [Benjamin] Franklin, Mr. [Silas] Deane, and Mr. [Thomas] Jefferson, were elected. Resolved, That a committee of four be appointed to prepare the draught of letters of credence to the above gentlemen, and that the said committee report the ways and means of providing for their subsistance. The members chosen Mr. [Robert] Morris, Mr. R[ichard] H[enry] Lee, Mr. [George] Wythe, and Mr. J[ohn] Adams. Resolved, That secresy shall be observed until the farther Order of Congress; and that until permission be obtained from Congress to disclose the particulars of this business, no member be permitted to say anything more upon this subject, than that Congress have taken such steps as they judged necessary for the purpose of obtaining foreign Alliance. Resolved, That an express be sent to Mr. Jefferson to inform him of his appointment, and that a copy of the resolve for secresy be at the same time transmitted to him, and that he be requested to inform the president at what time and place the vessel shall meet him. Resolved, That the members be two. The members chosen, Mr. [Richard] Stockton and Mr. [George] Clymer. Resolved, That the committee now appointed be directed to draw up, and report to Congress, a set of instructions for the commissioners, relative to their entering into treaties or negotiations with other foreign states in Europe. Resolved, That the Secret Committee be directed to deliver to Lieutenant Pendleton, 8 lb. of powder, for the use of his company. To Captain Philip Graybill, of the German batallion, the balance of his account for arms, accoutrements, &c. for the use of his company, and for provisions supplied them on their march from Maryland to Philadelphia, 1,168 5/90 dollars. Resolved, That the committee appointed to superintend the publication of the journals, be empowered and instructed to employ Robert Aitkin, to reprint the said journals from the beginning, with all possible expedition, and continue to print the same: And that this house will purchase of him 500 copies of the said journals when reprinted; and further, that he be directed to purchase, on reasonable terms, such parts of the journals as Mr. Bradford, and Cist & Co. have printed, and not yet published, to be paid for by the Congress. Resolved, That General Washington be directed to procure, as soon as possible, an exchange of the officers and soldiers taken on Long Island, for the same number of British officers and privates, now prisoners to the United States. Adjourned to 10 o’Clock to Morrow. The Benjamin Franklin Founding Father Commemorative Silver Dollar coin shows against a background of eyeglasses, a quill pen and a piece of paper.